White, an evangelical minister and former ghostwriter for Jerry Falwell, Pat Robertson, and other prominent leaders of the religious right, here describes his half-century-long struggle to accept himself as a gay Christian. Deeply angered by the recent gay-bashing tactics of his former clients, White says he could stand to "be a ghost no longer''; after years in the closet, writing for others, he finally had to tell his own story. He leads us though his shame-ridden adolescence, his anguishing attempts to make his marriage work, his high-speed career as a Christian writer and minister, and, perhaps most painfully, his attempts to "cure'' himself of homosexuality through prayer, electric-shock therapy, and guilt. White's is the story of a "man of God'' enduring nearly unbearable suffering before finding the strength to preach the good news. It is also a coming-out story. White's style suffers, at points, from the pitfalls of cliche and polemical simplification. 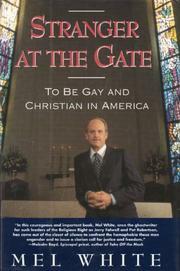 Yet his ability to reconcile his divergent identities, as preacher and gay man, gives his voice a unique, impassioned confidence. His tale is inspired, and strengthened, by a commitment to two warring communities. He seeks acceptance and civil rights for other gay men and lesbians yet also wants to deliver his fellow Christians from their own hatred. Readers will be moved by White's search for an accepting community, which he finally finds in the Metropolitan Community Church, a gay and lesbian nondenominational Christian congregation. Stranger at the Gate is likely to provoke useful dialogue among mainstream Christians and to offer unsentimental hope and comfort to many who are struggling to reconcile homosexual desires with hostile, yet deeply valued, religious traditions.